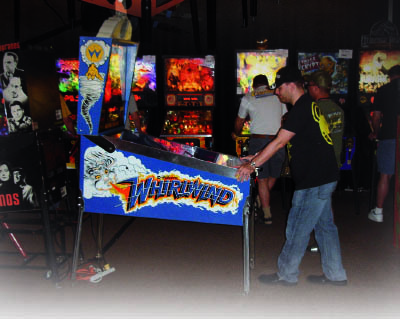 There was a solid mix of games that represented all eras of pinball. The grand total was 233 machines. While the expected extremes of game quality existed, there were a healthy number of machines in exceptional condition and I personally saw very few games that had become non-functional during the show. 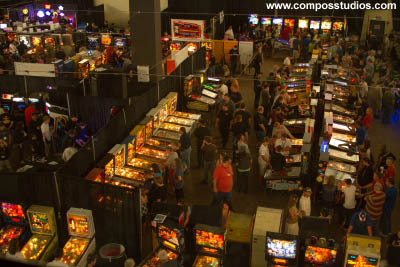 To help encourage quality games at the show the organizers offer cash prizes for best of show in a variety of categories. In 2012 they handed out $1,100 to these prize winners. 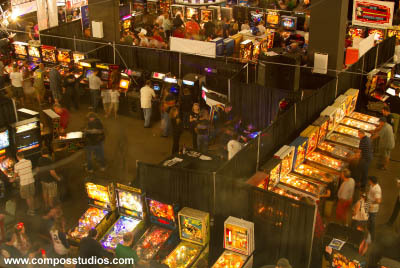 The venue is exceptional � the hotel is very nice, it is convenient to the D/FW airport and is located close to a variety of other attractions which provides a nice option for family members who may not be up for a full weekend of emersion in pinball. The layout of the exhibit hall was good but the show drew such huge numbers of people that at times things got a little crowded. There was a very nice assortment of vendors at the event. Parts and supplies were readily available. Many of the games on the floor were for sale. Plenty of game room d�cor was offered. 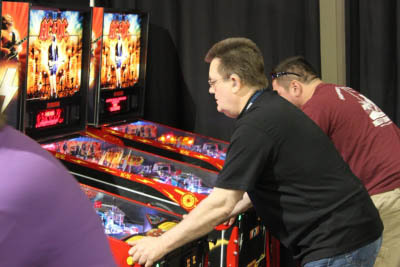 FarSight Studios was at the show and had a terrific hands-on world premier demo of the home console version of their latest game called the Pinball Arcade. They showed off their four launch tables: Tales of the Arabian Nights, Ripley�s Believe It or Not, Theatre of Magic, and Black Hole. Elevation Games had a Medieval Madness with a color display from ColorDMD. ColorDMD is an LCD display designed to replace the traditional orange dot matrix displays used in pinball machines. Round dots are drawn to the LCD to emulate the original dots. Because it�s an LCD, any color dot is possible. By adding in proprietary algorithms and hardware, a multicolor display is created to enhance games designed originally with only one color. PinballControllers.com had a booth to show off their P-ROC and PDB driver boards that allow you to do custom machine development, including custom software, re-themes, or complete custom machine creations. They had a P- ROC/PDB demo fixture showing the P-ROC/PDBs in action and a prototype pinball machine that illustrated numerous interesting features. Plenty of parts and supplies were available. 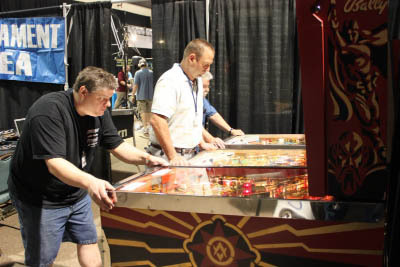 Illinois Pinball had their usual huge assortment of items available at the show. Marco was there with a nice booth and some of the late model Stern games to play. Local parts maven Chris Munro had his usual booth that was packed to the gills with used parts for both EMs and solid state machines. The flea market at the TPF is small in relative terms compared to Allentown - but what show�s isn�t? However, it is still an entertaining Saturday morning diversion and some very interesting things show up. There are always plenty of good bargains to be had and games and parts were exchanging hands at a brisk pace. Plus it is free for buyers. While I never participate in tournaments at these events, I know many people do and they are a big draw. The TPF staff does an incredible job here. They provide a wide variety of tourneys and brackets and fund a good amount of cash prizes for the higher level tournaments. 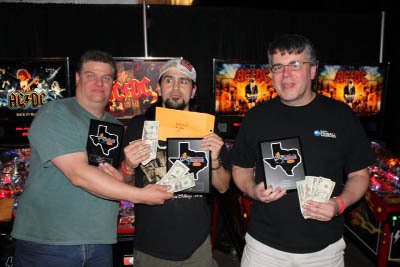 They awarded $3,275 in tournament money plus prize packages and trophies. The Texas State Championship rounds are played by the participants with the highest combined rankings in the EM, Classic, Modern and Texas Shoot Out tourneys. 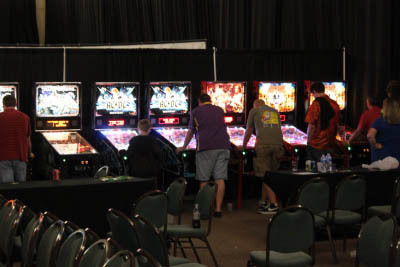 Seminars were great and included Jack Guarnieri of Jersey Jack Pinball, designer George Gomez and Steve Ritchie. Gerry Stellenberg of PinballControllers.com and local collector and restorer extraordinaire Alan Lewis gave a very detailed and informative talk on reproducing playfield plastics. It was altogether a totally awesome three days of pinball fun. Read the full version of Bob�s report in the next PGJ and look for a timely report of the 2013 show soon. Check out the website by clicking TEXAS and if you see me there, make sure to stop by and say Howdy!